Thank you all ! Welcome to our 1st Anniversary Issue! Yes, thatâs right, we actually made it a whole year! When Gaurav and I started this magazine, we had no idea how much we would end up needing to learn. But learn we did, as well as adding staff members to help out with proofing and website maintenance. 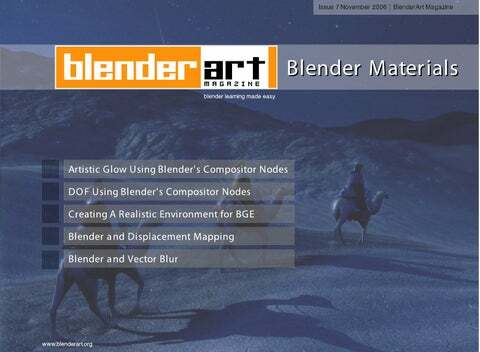 It has been an eventful year for both BlenderArt Magazine as well as the Blender community itself. We have seen the creation and release of Elephantâs Dream, the addition of many needed and just plain wanted features in Blender. The Blender community continues to grow at a phenomenal rate. 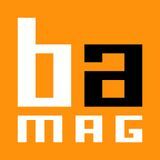 BlenderArt Magazine reader numbers have continued to grow as well. With each new issue, we gain a larger audience. And we appreciate all of you! We have had an amazing response from the community in terms of contributions to the magazine. While Gaurav and I could have still put out a magazine without all their help, it would not have been anywhere near as interesting. Iâd like to recognize all of our contributors at this point; they deserve a round of applause for their efforts on all our behalves. W h at do you s m e l ll ik e ? O fte n you can ide ntify im portant cl ue s by noticing h ow th e obje ct s m e l l s .Le ath e r s m e l l s diffe re nt th an pl as tic, diffe re nt m e tal s h ave diffe re nt s m e l l s. H ow can Is e e you? Ide ntify th e l igh t s ource , l igh ting ofth e m ate rialw il l pl ay an im portant part in h ow it is re cre ate d.W arm l igh t s ource s w oul d produce w arm h igh l igh ts or h ots pots , cooll igh ts th e oppos ite .W h e n gath e ring your re fe re nce m ate rial s , m ak e s ure to note in a journalor m e ntal l y w h at th e l igh t s ource w as , tim e ofday (ifouts ide )s o you can re cre ate th e m ate rial accurate l y. W h e re are you? Is th e obje ct ins ide or outs ide ?Ifouts ide , it w il lbe e xpos e d to w e ath e r, h e at, m ois ture .Th is w il laffe ct its appe arance .Ne w obje cts q uick l yl os e th e ir ne w appe arance by acq uiring de nts , dings , s cratch e s , dus t e tc.K now ing w h e re it is l ocate d w il lh e l p ide ntify th e s e q ual itie s . W h at do you l ook l ik e ? Now com e s th e part w h e re you s tart de s cribing th e te xture q ual itie s .Th e be tte r you can de s cribe w h at you s e e , th e e as ie r it w il lbe to re cre ate . Som e th ings to l ook for: Col or te xture Re fl e ctions and s h adow s Is th e obje ct trans pare nt? Is th e obje ct l um inous ? W ith h e at? W ith out h e at? From an outs ide s ource ? From th e obje ct its e l f? W h at’s your s tory? Try to ide ntify th e h is tory ofth e obje ct, h ow h as us age contribute d to w e ar and te ar? By ans w e ring th e s e q ue s tions , you w il lbe tte r unde rs tand your m ate rialand h ow to go about re cre ating it.It w il l , ofcours e , tak e practice and l ots ofobs e rvation to m as te r th e s e s k il l s .You ne e d to l e arn to train your artis tic e ye to re al l y s e e w h at you are l ook ing at.Soon, bre ak ing m ate rial s dow n w il lbe autom atic and your m ate rial s w il lim prove dram atical l y. Th e inform ation for th is articl e w as paraph ras e d from O w e n D e m e rs book ‘D igitalTe xturing & Painting’ (ISBN 0- 7357- 09 18- 1).Ih igh l y re com m e nd re ading th is book for anyone w anting to tak e th e ir m ate rials k il l s to th e ne xt l e ve l .
Artistic Gl ow U sing Bl e nde r's Com positor Node s - by D anie lLaBarge Artis tic Gl ow is an e ffe ct th at is a com pone nt of al m os t e ve ry m ajor ph oto e diting s oftw are pack age .Bl e nde r h as th e abil ity to re cre ate th is e ffe ct, but w ith m ore controland m ore fine s s e , be caus e ofth e uniq ue node bas e d s ys te m in w h ich gl ow can be appl ie d.Th e re are m any w ays ofadding gl ow , incl uding us ing oth e r program s s uch as GIM P or Bl e nde r's Gl ow pl ugin for th e s e q ue nce r.W e are going to tak e a l ook at h ow to add gl ow us ing Bl e nde râ&#x20AC;&#x2122;s Com pos itor Node s .
Pre re q uis ite s Th is articl e as s um e s th at you h ave a s ce ne w h ich contains s om e are as ofcontras t and th at you k now your w ay around Bl e nde r.It is s afe to s ay th at th is is for inte rm e diate to advance d us e rs . Ge tting Starte d To cre ate Gl ow in Bl e nde r w e ne e d to do s e ve ral th ings .Firs t, e nabl e th e Com pos itor.To do th is , pl e as e re fe re nce Im age 1 w h ich s h ow s th e D o Com pos ite e nabl e d.You can find th e s e in th e Re nde r Buttons (F10)unde r th e Anim Pane l . Now w e are re ady to be gin com pos iting our s ce ne w ith Gl ow .O pe n up th e Node Editor W indow and by de faul t it s h oul d h ave a Re nde r Laye rs node conne cte d to tw o output node s , Vie w e r and Com pos itor.It is a good ide a to ope n up th e UV Im age Editor W indow and s w itch th e im age to Vie w e r Node to ge t a l arge r vie w ofth e Vie w e r output.Th is h e l ps w ith fine tuning. Im age 1.Enabl ing node com pos itor Le t's firs t tak e a l ook at th e im age as re nde re d original l y.O bvious l y th e s ce ne is s e tup w ith are as ofs trong contras t to h e l p w ith appl ying re al is tic Spe cul ar Gl ow ins te ad ofjus t Inte ns ity Gl ow .W e w il lbas e th e gl ow on th is col or val ue , and th e n m ix th e gl ow m as k on top to com pl e te th e Gl ow e ffe ct.
Cre ating th e Gl ow M as k To cre ate th e Gl ow M as k w e ne e d to h igh l igh t th e de tail s in th e im age .To do th is Il ik e to firs t us e a Sh arpe n Fil te r.Add a Fil te r node and h ook up th e Im age input to th e Im age output ofth e Re nde r Laye rs node .H ook ing up a Vie w e r node to th e output Im age ofth e Fil te r node w il ldis pl ay th e re s ul ts ofth e fil te r e ffe ct.W e w il lbe us ing Fil te r Type Sh arpe n, as te s ts h ave s h ow n it to be th e be s t for e nh ancing th e de tail s ofth e im age , al th ough it cre ate s m any artifacts w h ich w e w il l h ave to de alw ith l ate r.
Im age 2.Exam pl e s ce ne in diffe re nt s e ttings ne e d to m odify th e RGB col or val ue s .Th e node for th is is th e RGB Curve s node .H ook th e Im age output ofth e Fil te r node up to th e Im age input of th e RGB Curve s node . Th e curve re q uire s tuning according to your s ce ne .You w ant a picture th at e xh ibits th e m os t contras t be tw e e n dark ne s s and l igh tne s s .To adjus t th is curve us e th e Com bine curve tab and se l e ct l ocations on th e curve and m ove th e m . H ook ing up a Vie w e r node to th e Im age output h el ps . Afte r th e output h as e nough contras t you now ne e d to conve rt th is to bl ack and w h ite .For th is s te p w e 'l lne e d to add an RGB to BW Conve rte r node .H ook up th e Im age output ofth e RGB Curve s node to th e Im age input ofth e RGB to BW Conve rte r node and th e n h ook up th e output to a Vie w e r node to s e e th e re s ul ts . W e 're al m os t th e re , but as you can s e e , th e m as k is ve ry pixe l ate d and h as l ots ofartifacts .To fix th is , w e ne e d to bl ur it. Add a Bl ur node , conne cting th e Val ue output of th e RGB to BW Conve rte r node to th e Im age input ofth e Bl ur node .Us e a fil te r type ofQ uadratic and a pixe lradius (X and Y s e ttings )appropriate for th e s ce ne .Enabl ing Gam m a bl urring al so h e l ps . H ook up a Vie w e r node to th e output to s e e th e finalgl ow m as k .
Appl ying th e Gl ow M as k To appl y th e Gl ow M as k to th e Im age w e ne e d a M ixe r node .Th is node tak e s th e Im age inputs and th e n m ixe s th e tw o inputs toge th e r bas e d on a Fil te r Type .In m os t cas e s you w il lw ant to us e th e Add type .Th is w il lpe rform a pixe l - by- pixe laddition be tw e e n th e tw o col or val ue s ofth e Im age inputs . Im age 3 Th e Noodl e s for 'Soft Gl ow ' diffe re nt val ue s at e ach s tage in th e com pos ition. Al s o incl ude d is th e s ch e m atic for th e Gl ow node s e tup. FinalTouch e s You can now h ook up a Vie w e r node and a Com pos itor node to th e Im age output ofth e M ixe r node . You w il ls e e th e com bine d im age s w ith th e Gl ow e ffe ct.Ifal lw e nt corre ctl y, you s h oul d now h ave a picture th at h as inte ns ity al ong al lofth e e dge s th at e xh ibit s pe cul arity or inte ns e l igh t diffus ion. You can us e th e Factor s e tting in th e M ixe r node to controlth e m ixing ofth e tw o Im age inputs .Fine tuning m ay be re q uire d, and th e e xtra Vie w e r node s w il lh e l p m ak e tuning e as y. NO TE NOTE: Th is articl e w as cre ate d us ing a CVS ve rs ion of Bl e nde r and s om e fe ature s s h ow n in s cre e ns h ots m ay not be avail abl e at th e curre nt publ ication ofth is articl e .Th rough th e m ain Bl e nde r re l e as e h ow e ve r, th e e ffe ct de s cribe d h e re can be us e d in th e curre nt Bl e nde r re l e as e .
Th is s ch e m atic s h ow s th e Gl ow node s ins ide a Group node cal l e d Gl ow .Th is is not re q uire d for th e final output. You s h oul d find a re fe re nce Bl e nde r fil e incl ude d w ith th is is s ue to track and trace a w ork ing e xam pl e ofth is s e tup. Be s ure to vis it h ttp://w w w .ids tudios .org for m ore inform ation on cre ating Gl ow and oth e r s pe ciale ffe ct node s .
O ffs e t and Size .O ffs e t, in m y e xpe rie nce , h as al w ays be e n a ne gative val ue and it appe ars to be th e Bl e nde r grid units from th e cam e ra to th e focus .Size appe ars to be a gradie nt fil te r th at control s th e abruptne s s ofth e trans ition be tw e e n s h arpne s s and bl urrine s s w h e n us e d w ith th e Bl ur node . D e pth O f Fie l d U sing Bl e nde r's Com positor Node s - by D anie lLaBarge D e pth ofFie l d (D O F)is a ve ry popul ar e ffe ct to be s im ul ate d in com pute r ge ne rate d im age ry as it adds to th e ove ral lre al is m ofan im age .True , D O F as your e ye pe rce ive s it is not ye t pos s ibl e w ith Bl e nde r, but a ve ry cl os e s im ul ation offore ground and back ground bl ur can be ach ie ve d.W e w il lbe l ook ing at one m e th od, us ing Bl e nde r's buil t in Com pos itor Node s .
Pos itive val ue is us e d for back ground bl ur and a ne gative val ue is us e d for fore ground bl ur.Th e cl os e r th e val ue is to 0, th e s ofte r th e gradie nt.Ne gative val ue s are typical l y ve ry s m al l , us ual l y no m ore th an - 0.250.You can tak e a l ook at th e ne w Z ch anne loutput by h ook ing up a Vie w e r node to th e Val ue output and l ook ing at th e Z ch anne lin th e UVIm age Editor. Im age 1 Enabl ing node com pos itor and Z pas s output.Th is h e l ps w ith fine tuning. Le t's tak e a l ook at th e im age as re nde re d original l y. O bvious l y th e s ce ne is s e tup and th e el e m e nts are arrange d to e xh ibit good D O F. W e w il lbe bl urring th e col or val ue s us ing th e de pth ch anne l . Now l e t's l ook at th e Z Ch anne l , de l ive re d in th e Z Pas s to th e Com pos itor.To do th is , add a ne w Vie w e r and conne ct th e Z input to th e Z output ofth e Re nde r Laye r node .In th e UV Im age Editor cl ick on th e icon th at s h ow s th e Z val ue .Th is is w h at th e de pth val ue s l ook l ik e for th e s ce ne . Cre ate tw o M ap Val ue node s and h ook th e m up to th e Z output ofth e Re nde r Laye rs node .Se t O ffs e t to a ne gative val ue , approxim ate l y th e s am e num be r ofgrid units from cam e ra to focus point. Th e O ffs e t val ue s s h oul d be ide nticalor ve ry cl os e .Th e Size val ue for one s h oul d be a ne gative val ue be tw e e n - 0.050 and - 0.250, and th e oth e r s h oul d be a pos itive val ue be tw e e n 0.250 and 1.000. Bl urring th e Im age Ne xt w e 'l lne e d to us e th e s e val ue s to bl ur th e im age .Th is is w h e re th e Bl ur node com e s into pl ay. Add tw o Bl ur node s and h ook up th e Im age input to th e Im age output ofth e Re nde r Laye r node . H ook up th e Size input to th e Val ue output ofth e M ap Val ue node .Re pe at for th e oth e r M ap Val ue node .Th e Bl ur node h as s e ve rals e ttings . Ih ave found th at Q uadratic fil te r type and Gam m a e nabl e d w ork be s t.Th e X and Y s e ttings control th e radius ofth e bl ur e ffe ct in pixe l s .For m ore bl ur us e a h igh e r num be r.Ifyou h ook up a Vie w e r node to th e Im age output you w il ls e e th e re s ul ts ofth e D O F and you can e dit th e M ap Val ue s accordingl y. Th e one Vie w e r node w il ls h ow th e fore ground bl ur and th e oth e r w il ls h ow th e back ground bl ur. Now w e h ave th e tw o im age s bl urre d but w e ne e d th e fore ground and back ground bl ur com bine d. Th e re are s e ve ralw ays to do th is but th e prope r w ay is to us e anoth e r s pe cial ty node .Th is node is cal l e d Z Com bine .H ook up th e Im age output of one Bl ur node to th e firs t Im age input ofth e Z Com bine node , and th e n h ook up th e oth e r corre s ponding M ap Val ue 's Val ue output to th e Z input ofth e Z Com bine node . Re pe at for th e oth e r Bl ur node and M ap Val ue node .Notice th at th e corre s ponding Im age input goe s to th e oppos ite Val ue output ofth e M ap Val ue node .Th is is im portant to prope rl y com bine th e tw o im age s w ith out artifacts . FinalTouch e s You can now h ook up a Vie w e r node and a Com pos itor node to th e Im age output ofth e Z Com bine node and you w il ls e e th e com bine d im age s w h ich w il ls h ow th e D O F e ffe ct.Ifal lw e nt corre ctl y you s h oul d now h ave a picture th at h as fore ground bl ur and back ground bl ur w ith th e ce nte r range s h arp and in focus .Fine tuning m ay be re q uire d, and th e e xtra Vie w e r node s w il lh e l p m ak e tuning e as y. Be l ow you w il ls e e th e output s e ttings for th e diffe re nt val ue s at e ach s tage in th e com pos ition. Al s o incl ude d is th e s ch e m atic for th e D O F node s e tup. w h il e trying to m ix val ue s .Th e s e cre t to anim ate d D O F is to m ix â&#x20AC;&#x153;k e yfram e dâ&#x20AC;? M ap Val ue s al ong a Tim e node .As l ong as you h ave th e D O F s e t for a particul ar fram e you can controlth e M ixing us ing th e curve in a Tim e node .Th is can ge t re al l y bul ky and Ican't w ait for th e Bl e nde r de ve l ope rs to cre ate an input for th e M ap Val ue O ffs e t, but until th at fe ature is im pl e m e nte d you can us e th e re fe re nce s ch e m atic be l ow . You s h oul d find a re fe re nce Bl e nde r fil e incl ude d w ith th is is s ue to track and trace a w ork ing e xam pl e ofth is s e tup. NO TE Th is s ch e m atic contains a cus tom Group node for adding D O F to th e finalcom pos ition, and is not re q uire d for th e finaloutput. Image4 DOF Noodles for Animation Special thanks go to Claas Eicke Kuhnen (aka cekuhnen) of BlenderArtists who helped explain the node setup for a similiar DOF approach to the Blender Community. w ayw ard pl aye rs are de voure d by “grue s .” Th e s e are not re com m e nde d be caus e th e y s e e m unfair to th e pl aye r, and cos t l ive s .Ifyou de cide to us e a de ath zone , m ak e s ure th at th e pl aye r is w e l l inform e d ofth e are a's s tatus .Noth ing is m ore frus trating th an a “s urpris e ” de ath zone . Cre ating Re al istic Environm e nt For Th e Bl e nde r Gam e Engine - by Jh on Al l ie Bl e nde r's gam e e ngine is fairl y s im pl e as s uch th ings go, but w ith a l ittl e h ard w ork one can s til l cre ate re l ative l y re al is tic gam e s .In th is articl e , I’m going to try to h e l p you l e arn h ow you can us e th e s e fe ature s to m ak e your Bl e nde r gam e s as re al is tic as pos s ibl e.
Im age 1 D iffe re nt e nvironm e nt bounds Is l and is us ual l y w h at it s ounds l ik e .Th is is an e xtre m e l y popul ar m e th od ofde fining s ce ne boundarie s : s im pl y put in a vas t oce an and pe opl e im m e diate l y as s um e th e y cannot trave rs e it.In m y gam e Th e Voyage ofth e Gol de n Arm , Ius e d th e Is l and te ch niq ue in a de s e rt as w e l l : one ofth e gam e 's l e ve l s tak e s pl ace on a l arge h il l , w h ich is s urrounde d on al ls ide s by a de s e rt w as te l and.Th e e ffe ct is th e s am e th ough th e “oce an” is an oce an ofs and and not w ate r.Anoth e r variation is th e “butte ,” in w h ich th e gam e are a is atop a h igh cl iff, s urrounde d on al ls ide s by ve rticaldrops . Is l ands can al s o be com bine d w ith invis ibl e w al l s , to pre ve nt th e m os t de te rm ine d pl aye rs from w al k ing too far into th e oce an. Canyon is an e nvironm e nt w h ich is s urrounde d on al ls ide s by ins urm ountabl e w al l s .Pre fe rabl y, th e s e s h oul d be h igh w al l s : s h ort fe nce s te nd to frus trate pe opl e , as in re all ife th e y w oul d s im pl y s te p ove r th e m .Th e be s t Canyon w al l s s h oul d be m uch h igh e r th an th e gam e ch aracte r's h e igh t. Tunne lw as popul arize d in gam e s l ik e D oom , w h e re al lth e action tak e s pl ace ins ide cl os e d- in corridors . Tunne l s h ave fal l e n out offavor be caus e th e y al l ow for ve ry l ittl e varie ty in your gam e s ce ne ry. Im age 2.Th e Is l and s ce ne In al ll ik e l ih ood, your gam e art is not as bad as th is , but th is doe s de m ons trate q uite a fe w ofth e probl e m s I've s e e n in be ginne r art.W e 'l lus e te ch niq ue s ofs h ading, te xturing, and m ode l ing to m ak e th is is l and m ore re al is tic. Sh ading Sh ading is h ow w e s im ul ate l igh ting in th e gam e e ngine .Sh ading de fine s l igh t and dark ne s s on your m ode l s , and is one ofth e m os t im portant tool s for adding re al is m . Th e e as ie s t w ay to s h ade your m ode l s is to m ak e th e m l igh t- s e ns itive .Se l e ct th e m ode lyou w ant to m ak e l igh t- s e ns itive , pre s s F to e nte r UVface se l e ct m ode , and pre s s W to ope n th e Spe cial s m e nu. (It's im portant to m e m orize h otk e ys , e s pe cial l y unintuitive one s l ik e th is one .) Se l e ct Ligh t from th e Spe cial s m e nu. Im age 6 Sm ooth e d, l igh t- s e ns itive is l and for al lth e obje cts : Ligh t s e ns itivity is not a good s ol ution for inanim ate obje cts , th ough , be caus e it e ats a l ot of proce s s or pow e r.
3D W ork sh op - Cre ating Re alis tic Environm e ntFor Th e Bl e nde r h as anoth e r l igh t- s im ul ating fe ature , th ough , w h ich s im ul ate s th e l igh t onl y once , th e n bak e s it to th e obje ct's ve rte x col ors . Sim pl y se l e ct th e obje ct you w is h to appl y th e e ffe ct to, and cl ick th e Ve rtColbak e button in th e Edit Buttons . Care fulus e ofve rte x col ors can do w onde rs for your gam e e nvironm e nt.In th e re alw orl d, one ne ve r e ncounte rs an obje ct w ith out s h ading, s o it's im portant to k e e p th is in m ind w h e n m ak ing your gam e e nvironm e nts .Sh ade e ve ryth ing, no m atte r h ow s m al lit is ! M ode l ing Now w e 'l ll ook at h ow to im prove your gam e m ode l ing.Le t's tak e a l ook at th e w ire m e s h ofour ugl yl ittl e is l and. Im age 15 Is l and M e s h W h at appe ars to be a s im pl e s ce ne is not ve ry s im pl e from th e e ngine ’s point- of- vie w ! Th e is l and is m ade from a com pl e x UVs ph e re , th e m onk e y h e ad h as be e n “s ubs urfe d,” and th e tre e s and buil ding col um ns are both m ade from cyl inde rs at th e de faul t s e tting, 32.It's im portant to re m e m be r h e re th at th ough Bl e nde r can be us e d to m ak e gam e s , its prim ary purpos e is cre ating re nde re d im age ry. 3D W ork sh op - Cre ating Re alis tic Environm e ntFor Th e W e 'l lfix th e col um ns firs t.Th e col um ns , as you can s e e in th is im age , appe ar to be al m os t a s ol id col or.W h e n your gam e m ode l s l ook l ik e th is , it’s a fair be t you've us e d too m any pol ys .Th irty- tw o, th e de faul t s e tting for cyl inde rs , is ove rk il lfor th e gam e e ngine .Te n ve rtice s s h oul d be e nough , you can probabl y ge t aw ay w ith onl y 7, and you s h oul d ne ve r ne e d m ore th an 15 or 20. W e 'l lcre ate a ne w col um n m ode land s e t it to 10 ins te ad of32. As you can s e e , a col um n w ith 10 ve rtice s s til l l ook s ve ry round.It's not im portant to m ak e e ve ryth ing in your gam e h ave a “pe rfe ct” s h ape . Pe opl e e xpe ct gam e obje cts to h ave s l igh tl y jagge d s h ape s , and th e m ind can e as il y fil lout th e m ode lto its corre ct s h ape . button, s e l e ct th e h idde n face s at both e nds w ith th e B- k e y s e l e ct m ode , pre s s th e D e l e te k e y, and cl ick Face s . Re m e m be r to ch e ck for th e s e face s ! Th e y're ve ry com m on, and th e y do te nd to add up.Unim portant as th e y m ay s e e m , h aving l arge num be rs ofth e m can l e ad to a gam e s l ow dow n.
Th e trick is to find th e h appy m e dium be tw e e n too m any ve rtice s and not e nough .Te n is jus t about righ t for th is col um n.For a bigge r col um n, 20 m igh t be m ore appropriate .For ve ry s m al lobje cts , you m ay w ant to re duce th e num be r to four or e ve n th re e .Avoid 6- or 8- s ide d cyl inde rs , th ough : th e m ind is fam il iar w ith th e s e s h ape s and your pl aye r m ay h ave a h ard tim e ignoring th e m . Low - pol y m ode l ing al s o m e ans re m oving anyth ing th at is not ne e de d, w h ich incl ude s face s th at can't be s e e n.Th is col um n h as face s on e ith e r e nd w h ich cannot be s e e n.Cl ick th e “face s e l e ction” Im age 17 Se tting num be r ofve rtice s for a cyl inde r Im age 20 Care l e ssl y m ade te m pl e s te ps Cons ide r th is : Each col um n h as 10 face s on e ach e nd, none of w h ich are vis ibl e to th e pl aye r.W ith al lfour ofth e buil ding's col um ns , th e re are 80 e xtra face s ! Al w ays re m e m be r to ch e ck for and e l im inate gam e e ngine w as te . Now , l e t's tak e a l ook at th e te m pl e s te ps . Som e tim e s , w e ne e d to divide face s into s m al l er face s in orde r to cre ate s om e th ing.O ne w ay to cre ate m ore face s is to us e th e Subdivide tool , but th is tooldivide s e ve ry face into l ots ofs m al l er face s , cre ating a l ot ofunne ce s s ary e xtra face s and adding to gam e e ngine w as te . A m uch be tte r option is to us e th e K nife tool . 3D W ork sh op - Cre ating Re alis tic Environm e ntFor Th e Th e K nife tool 's purpos e is to add e xtra ve rtice s to an e dge .Th is w il lal l ow you to divide up your m ode l 's face s onl y as m uch as th e y ne e d to be divide d, and pre ve nt gam e e ngine w as te .To us e th e K nife tool ,s e l e ct th e e dge s you w is h to ope rate on and pre s s Sh ift+ K .Th e K nife m e nu w il l appe ar. Se l e ct Exact Line for now , and th e n draw al ine th rough your e dge s and pre s s Ente r.
Im age 21 Us ing th e K nife tool O ur face is now cut in h al f, and re ady to be e xtrude d into s te ps ! Ifw e h ad us e d Subdivide , th e face w oul d h ave be e n divide d into four s e ctions , far m ore th an w e actual l y ne e d. Now w e can e xtrude th e face and finis h cre ating our s taircas e . Th e re s ul t w il lbe a bas e for th e te m pl e w ith fe w e r th an h al fth e face s ofth e original . D on't forge t to de l e te th e unde rs ide ofth e te m pl e 's bas e : it w il lbe unde rground, s o th e re is no re as on to s ave it. Th e te m pl e is pre tty good now ! Le t's l e ave it al one and tak e a l ook at th os e obnoxious pal m tre e s .
Th is is not a pal m tre e .Th is is a cartoon ofa pal m tre e , and a ve ry h igh - pol y one at th at.Th e trunk , l ik e th e col um ns on th e buil ding, is a 32- ve rte x cyl inde r.It is abs urdl y s traigh t: th e naturalw orl d s im pl y doe s not h ave s uch s traigh t l ine s .O ur firs t orde r ofbus ine s s w il lbe to im prove th is trunk . Add a 7- ve rte x tube and re s ize it untilit's l ong, s traigh t, and narrow .Scal ing it s m al lth e n e nl arging it on th e Z axis s h oul d w ork . (M ak e a h abit of us ing tube s in pl ace of cyl inde rs w h e n ne ith e r e nd w il l be vis ibl e . In th is cas e , one e nd ofth e trunk w il lbe be l ow ground, and th e oth e r w il lbe above pl aye rs ' h e ads . Ne ith e r w il lbe s e e n, s o you can us e a tube in pl ace ofa cyl inde r and s ave yours e l fs om e pol ys .) O nce your tube is re ady, us e th e K nife toolto s l ice it up a fe w tim e s , th e n give it a s ubtl e be nd. Scal e it dow n a bit tow ard th e uppe r e nd. Th e re s ul t w il lbe a pl ane w ith a triangul ar face attach e d at e ach e nd.Now us e th e K nife toolto divide th e pl ane ve rtical l y dow n th e m iddl e. Se l e ct th e ne w ve rtice s and m ove th e m up s o th at th e l e afw il lcurve in th e m iddl e.
Im age 23 Ne w tre e m e s h Th is trunk is not onl y m ore e al is tic, it h as fe w e r pol ys as wel l ! 3D W ork sh op - Cre ating Re alis tic Environm e ntFor Th e Th is is our bas ic l e afm ode l .You can tw e ak it a l ittl e ifyou l ik e .It m ay not l ook ve ry m uch l ik e a pal m l e afye t, but th e te xture w il lim prove th at.It s h oul d be note d th at s ince l e ave s are cl os e to be ing fl at, it is pe rfe ctl y acce ptabl e , and re com m e nde d, to portray th e m w ith pl ane - bas e d obje cts l ik e th is one .In th e gam e e ngine , try to portray com pl e xity th rough te xturing rath e r th an m ode l ing, w h e ne ve r pos s ibl e . Th is pal m l e afdoe s not ne e d to be ve ry com pl e x, be caus e its true re al is m w il lbe appl ie d th rough its te xture .W e w il l be cove ring te xturing s h ortl y, but I'l ljum p ah e ad jus t a m om e nt to s h ow you w h at th e com pl e te d pal m tre e l ook s l ik e .
Im age 28 O riginal& Im prove d Pal m Tre e s Look h ow grote s q ue th e originalpal m tre e l ook s , now th at it's s h ow n be s ide one th at's s o re al is tic! It's al w ays w orth going th e e xtra fe w s te ps to m ak e your gam e l ook good.D on't be afraid to inve s t th e e xtra tim e - in al ll ik e l ih ood, your gam e w il lnot onl yl ook be tte r, but it m ay run fas te r as wel l .
Now s e l e ct a fe w ve rtice s and be gin m oving th e m . You w il ls e e th at ne arby ve rtice s w il lbe gin fol l ow ing th e m al ong.You can m ove th e m ous e w h e e lto adjus t th e e xte nt ofth e e ffe ct.Pul l up th e ground to m ak e s om e s ubtl e h il l s .Ipre s s e d Z w h il e trans l ating to l ock m ove m e nt to th e ve rticalaxis . e xpe rie nce s om e probl e m s due to th e fact th at face s are , by de faul t, vis ibl e on one s ide but not th e oth e r.You'l lh ave to re cal cul ate th e cl oud obje ct's norm al s to m ak e it vis ibl e from th e ins ide . In e dit m ode , s im pl y se l e ct al lits ve rtice s and pre s s Ctrl + Sh ift+ N. Th is s h oul d fix th e probl em. Im age 39 Pl anar Cl ouds w h e re as Tube cl ouds appe ar onl y at th e h orizon. Sph e re can be cons ide re d â&#x20AC;&#x153;th e be s t ofboth w orl ds ,â&#x20AC;? but it's a bit h arde r to w ork w ith .H ow e ve r, s om e pe rs e ve rance can ge t you a nice e ffe ct.
s e tting.In th e UVface s e l e ct m ode , pre s s A to se l e ct al lth e face s , and pre s s U to ch oos e a m apping option.Bl e nde r 2.42a de l ive rs a h orde of ne w UVm apping options , and I'l ladm it th at I'm not fam il iar w ith al lofth e m ye t! I've found, h ow e ve r, th at for re l ative l y fl at obje cts l ik e our is l and, th e “proje ct from vie w ” option w ork s nice l y. Se l e ct it w h il e vie w ing th e is l and from above , th e n s im pl y s cal e th e e ntire UVm ap up and dow n in th e UV w indow untilyou l ik e th e re s ul t.
Th ough s h ading and m ode l ing are both crucialto cre ating re al is tic gam e e nvironm e nts , your m os t pow e rfulw e apon by far is te xturing.It doe s not m atte r h ow pe rfe ct your m ode l s are or h ow w e l l th e y're s h ade d: ifth e y h ave bad te xture s , th e y w il l l ook te rribl e ! Te xturing is th e finalw ord, it al one “m ak e s or bre ak s ” your e nvironm e nt. Im ak e ne arl y al lofm y te xture s m ys e l f.Itak e ph otograph s ofinte re s ting s urface s and conve rt th e m into te xture s us ing Gim p.Th e re is no al te rnative to ph otograph ic te xture s w h e n one w is h e s to ach ie ve re al is m . Th e m os t im portant th ing to re m e m be r w h e n cre ating te xture s is to m ak e th e m s e am l e s s .You can do th is q uite e as il y in Gim p by navigating to Fil te rs - >M ap- >M ak e Se am l e s s in th e m e nus .Th is e ffe ct is not pe rfe ct, but it doe s h ide th e s e am s in your te xture s q uite nice l y.You m ay s til lne e d to dodge /burn by h and a l ittl e to e ns ure a uniform s h ade , but for th e m os t part, m ak ing te xture s is painl e ss. Im age 45 Im prove d UVm apping dras tical l y im prove d.Th e purpl e s pots , th ough not gone , are not s uch a big probl e m any m ore .You m ay s til lw ant to try to ch ange th e ir tone , th ough , w h ich can be e as il y ach ie ve d th rough s om e s m al l Gim p tw e ak s . Th e e as ie s t, and ofte n m os t e ffe ctive , m e th od is to s im pl y se l e ct a gre e nis h col or, th e n brus h ove r th e purpl e are as w ith th e brus h tools e t in “Col or” m ode . Im age 48 Gras s - > Sand Te xture w oul d be us e ful , it is be yond th e s cope ofth is articl e. Now , m ap your pl ain s and te xture (w ith out gras s ) onto th e face s around th e e dge ofth e is l and (Se e Im age 49 ). Ne xt, is th e tim e - cons um ing part. M ap th e â&#x20AC;&#x153;bl e nde dâ&#x20AC;? te xture w e m ade to th e face s in be tw e e n th e gras s face s and s and face s .Ifind th at th e 1/1 s e tting w ork s be s t for th is .Ge tting th is pe rfe ct can tak e a w h il e , s o be pre pare d to s pe nd a good de aloftim e on it. w h il e re ading th is articl e , you gaine d a be tte r unde rs tanding ofh ow to th ink l ik e a gam e de ve l ope r.W h e th e r or not you now h ave a l ittl e is l and s ce ne doe s not m atte r, w h at m atte rs is th at now you be tte r unde rs tand th e conce pts and appl ication ofgam e s ce ne cre ation in Bl e nde r.
Look at h ow re al is tic th e is l and is now com pare d to th e w ay it l ook e d at th e e nd ofth e M ode l ing s e ction! Th is s h ow s h ow im portant te xture s are to your s ce ne ry.W e coul d cal lth is finis h e d now , but l e t's appl y a fe w m ore ch ange s firs t. Firs t, l e t's fix th e te xture on th e oce an pl ane . Th e re 's noth ing w rong w ith th e te xture , but w e ne e d to s cal e up th e UVm apping s l igh tl y to incre as e th e de tailon th e w ate r s urface . Notice h ow e ve n s l igh t ch ange s can im prove th e ove ral lappe arance dras tical l y.Ial s o tw e ak e d th e s e a's ve rte x col ors s l igh tl y to m ore cl os e l y m atch th e s k y. Now l e t's add s om e s ubtl e w ave s th at l ap at th e e dge s ofth e is l and.Add a pl ane at th e e dge ofth e is l and and be gin e xtruding it s o it fol l ow s th e e dge cl os e l y.Ke e p doing th is untilyou've circum navigate d th e is l and, th e n m e rge th e e nds toge th e r to cre ate a continuous ring. M ak e a nice bl ack - and w h ite “rippl e s ” te xture , and m ap it 1/1 to th e face s . Se t al lth e face s to “Add” re nde r m ode , and paint th e oute r ve rtice s bl ack . Pl an ah e ad to cre ate th e be s t s ce ne pos s ibl e .Try to s tart w ith s om e ide a ofw h at you w ant th e finis h e d proje ct to l ook l ik e . Cre ate conce pt s k e tch e s ifyou pre fe r. Sh ade your m ode l s , e ith e r th rough ve rte x col ors or by us ing l igh t s im ul ation. Ke e p your e ye s ope n in th e re alw orl d, and try to l e arn h ow l igh t be h ave s . Th ink w h il e you m ode l : ne ve r us e 10 face s ifth re e w il ldo, and us e face - dividing tool s s paringl y. De l e te unne e de d face s , and ne ve r m ak e your m ode l s m ore com pl icate d th an ne ce s s ary.Try to s e e h ow s m al la face count you can ge t.
Im age 51 Im prove d O ce an Cre ate your ow n te xture s w h e ne ve r pos s ibl e .Bring your cam e ra w ith you on trips , and ph otograph as m any diffe re nt s urface s as pos s ibl e .W h e n proce s s ing your te xture s , s trive to obs cure th e re pe tition. Ne ve r be afraid to add re al is tic de tail s , e s pe cial l y one s w h ich h ave l ittl e e ffe ct on pol ycount. As a finaltouch , you m ay w ant to e xpe rim e nt w ith adding m otion.A s l igh t s w aying to th e tre e s or a s pinning w e ath e r- vane can add to th e gam e 's l ook be autiful l y.Th e w orl d is ful lofm otion, and a l ittl e m otion can be a gre at addition to your gam e . Try to m ak e s ure th at th e pl aye r is not th e onl y th ing m oving in your w orl d. And th at's th at! Ih ope you e njoye d re ading th e articl e .I've s trive d to incl ude in th is articl e e ve ryth ing a be ginning gam e artis t m igh t find us e ful . Adm itte dl y, th e re are a l ot ofth ings Ididn't m e ntion, but th e re is e nough m ate rialh e re to ge t s om e one on th e ir fe e t and s ol ve s om e com m on probl e m s .W ith th e s e s k il l s in pl ace , youâ&#x20AC;&#x2122;l lbe w e l l on your w ay to cre ating a gre at Bl e nde r gam e .Go s tart up Bl e nde r, and ge t to w ork ! Il ook forw ard to s e e ing w h at you cre ate ! 3D W ork sh op - Blende r And Ve ctor Blur Bl e nde r And Ve ctor Bl ur -by O l ivie r Saraja Introduction Ve ctor Bl ur is an inte re s ting s ol ution th at goe s be yond th e l im itations ofre gul ar M otion Bl ur.It re l ie s on th e Com pos ite Node s Editor to pe rform . But e ve n ifth e Node s Editor m ay l ook intim idating at firs t gl ance , it is in fact ve ry e as y to s e t up.Th is s h ort tutorialw il lgo th rough th e bas ic s te ps for e nh ancing your re nde rs (both s til l s and anim ations ) w ith good l ook ing m otion bl ur. Im age 1 An e xam pl e ofIPO curve s affe cting a m oving obje ct.
>>Ve ctor Bl ur.A ne w node s h oul d appe ar, titl ed Ve ctor Bl ur.M ove it be tw e e n th e tw o pre vious de faul t node s , and s tart th e m agic: conne ct th e output Im age , Z and Spe e d from th e Re nde r Laye r node to th e input Im age , Z and Spe e d from th e Ve ctor Bl ur node , us ing th e [LM B].O nce done , conne ct th e output Im age from th e Ve ctor Bl ur node to th e Im age input ofth e Com pos ite node . Firs t, you w il lne e d to turn one ofyour 3D vie w s into a Node Editor vie w .Th is is done by cl ick ing on th e grid- l ik e icon at th e l e ft e nd ofth e H e ade r of th e vie w .A m e nu w il lpop up and l e t you de fine th e type ofvie w ne e de d.Ch oos e th e Node Editor. ve l ocity) obje cts .Th is is re al l y us e fulduring cam e ra m ove m e nts or s l igh t back ground m ove m e nts . M axSpe e d - Ifyou h ave e xtre m e l y fas t obje cts in th e s ce ne but th e bl ur doe s not re nde r w e l l e nough , th e n you can m ak e us e ofth is param e te r to be tte r th e ve ctor bl ur.Note th at a 0.0 val ue m e ans th at no m axim um is us e d. Bl urFac - Th is param e te r w il ls cal e th e ve ctor s pe e ds , cal cul ating from th e m ove m e nts ofth e obje ct.Th e vis uale ffe ct is cl os e to th e s h utte r s pe e d ofa re gul ar cam e ra. Conce rning th e us e ofVe ctor Bl ur, a good tip is to put fas t m oving obje cts on a Re nde r Laye r, s l ow or s tatic obje cts on anoth e r, and to s pe cify inde pe nde nt param e te rs for e ach , for be tte r control . M ore ove r, l arge obje cts not e ntire l y s e e n from th e cam e ra s h oul d be s ubdivide d s o th at at l e as t s om e norm al s ofth e obje ct are actual l y s e e n from th e cam e ra, or th e bl ur e ffe ct coul d be draw n on th e w rong s ide , com pare d to th e m ove m e nt. Th e re are s om e l im itations th at you s h oul d k now about. h ttp://w w w .e ditions e yrol l e s .com /Livre /9 78221 2119 59 6/l a- 3d- l ibre - ave c- bl e nde r H e is al s o a cas ualW ik i contributor ofBl e nde r's docum e ntation. 3D W ork sh op - Bum p & Bl e nde r & D is pl ace m e nt M apping for Be ginne rs -b y M ich ae lW ach Introduction Bum p m apping and D is pl ace m e nt m apping are tw o s pe cialte ch niq ue s for m ak ing an obje ct appe ar to h ave a rough or irre gul ar s urface . W h at is Bum p m apping? Bum p m apping tak e s a grays cal e im age and re ads th e l igh t and dark inform ation to s im ul ate an irre gul ar s urface .W h e n you re nde r an obje ct w ith a bum p- m appe d m ate rial ,l igh te r (w h ite r)are as of th e m ap appe ar to be rais e d and dark e r (bl ack e r) are as appe ar to be l ow e re d.Note th at bum p m apping doe s not m odify th e ge om e try, onl y th e norm al s.
an e xtre m e l yl arge am ount ofpol ygons .Th is h igh re s ol ution obje ct can appe ar m uch m ore ph otore al is tic th an bum p m apping, ifus e d prope rl y.As com pute rs are be com ing m ore and m ore pow e rful , dis pl ace m e nt m apping m ay s oon be abl e to re nde r at s pe e ds ne ce s s ary for a re as onabl e gam e e ngine .H ow e ve r, curre nt te ch nol ogy doe s not m e e t th e h e avy proce s s ing re q uire m e nt. m ate rialin th e M ate rialSh ading Pane l[F5], and add a ne w te xture .Now s w itch to th e Te xturing Pane l [F6], w h e re w e w il lcre ate th e bum p m ap.From th e "Te xture Type "box, s e l e ct "M us grave ".Il e ft th e de faul t s e ttings al one , but you m ay ch oos e to pl ay around w ith th e m .You can al s o add a ram p- s h ade r h e re ifyou are pl anning on adding uniq ue col ors to th e te xture . Be fore you s tart Bum p m apping & D is pl ace m e nt m apping te ch niq ue s are ve ry fas t and e as y to do in Bl e nde r, e ve n ifyou are ne w to Bl e nde r's te xturing tool s. Pl e as e note th at dis pl ace m e nt m aps are not dis pl aye d in th e 3D vie w port. Bum p m aps can dis pl ay a ve ry bas ic pre vie w w ith s h ading [Sh ift+ Z ]turne d on. Now , w e ne e d to configure th e m os t im portant s e ttings for th e bum p m ap.Th e s e control s are l ocate d in th e M ate rialSh ading Pane l[F5]unde r th e "M ap To"tab.You m ay ch oos e to dis abl e th e te xture 's col or (Col )w h e n m odifying your bum p or dis pl ace m e nt m aps .Th is can s om e tim e s give you a be tte r ide a ofw h at's going on w ith e ach s e tting. Im age 4 Enabl ing Nor M apping To e nabl e bum p m apping, pre s s th e norm al(Nor) button.You can adjus t th e s tre ngth ofbum pine s s w ith th e s l ide r button l abe l e d "Nor". Us e bum p m aps w h e n you w ant to tak e th e s m ooth ne s s offa s urface , or to cre ate an e m bos s e d l ook .Ke e p in m ind, h ow e ve r, th at th e de pth e ffe ct ofa bum p m ap is l im ite d to th e norm al(Nor)s l ide r.
Th e w ay you cre ate a dis pl ace m e nt m ap is ve ry s im il ar to th e w ay you cre ate a bum p m ap.Th e onl y diffe re nce is , you m us t e nabl e th e dis pl ace m e nt (D is p)button.You m ay turn offth e norm al(Nor)button de pe nding on your de s ire d e ffe ct. Th e dis pl ace m e nt s l ide r control s h ow far aw ay from th e originalm e s h th e ve rtice s w il lbe m ove d. Th e norm al(Nor)s l ide r al s o h as a gre at im pact on your dis pl ace m e nt re s ul ts .Be care fulw h e n us ing dis pl ace m e nt m aps be caus e th e y can be ve ry proce s s or de m anding. O ve ral l , bum p m apping and dis pl ace m e nt m apping are ve ry h andy tool s ifyou k now h ow to us e th e m . M aps th at s h ade be tw e e n w h ite and bl ack ge ne ral l y w ork be tte r th an m aps w ith h ard e dge s be tw e e n th e w h ite and bl ack are as .Ih igh l y re com m e nd pl aying around w ith th e s e ttings and re nde ring your re s ul ts to h e l p de e pe n your unde rs tanding ofth e m both . Is an 18 ye ars ol d from Cl e ve l and, O h io.Curre ntl y s tudying at th e Unive rs ity ofAdvancing Te ch nol ogy. H e w ork s ove r inte rne t for a Ne w York City bas e d pate nt attorne y, cre ating 3D re pre s e ntations ofh is ide as us ing Bl e nde r 3D and YafRay.Al s o m ak e w e bs ite s , com pos e digitalaudio, re cord and e dit digitalvide os and w ork s w ith a l ot of2D il l us trations , te xture s , and ph otograph s .
Supe rs am pl ing’.Cre ate a ne w l aye r ove r th e nois e l aye r and draw a s m al lgradie nt ove r th e ne w l aye r (s e e Im g3)).O ne th ing to re m e m be r h e re is th at you s h oul d try to draw th e gradie nt ove r th e part ofth e s ol id nois e w h ich contains m os tl y w h ite and it’s s urrounding are as are dark e r. Th at is w h e re you ge t good contras t for th e l igh t bol t.
Th is tim e , w e w il ll e arn th e proce dure for cre ating al igh tning bol t s prite from th e GIM P. Ligh tning bol ts find good us e in 3D gam e SFX, l ik e zapping an ite m or e ne m y from an e l e ctric w e apon, de noting te ns ion in s ci- fi s ce narios , or jus t a naturall igh tning bol t to e nh ance th e e nvironm e ntalm ood. bol ts are h ardl y us abl e as th e y appe ar virtual l y gl ue d toge th e r.Go to Laye r>> Col or>> Le ve l s .Th is w il lbring up th e Le ve ladjus t dial og box (s e e im g6).D rag th e input l e ve l s m id- pointe r tow ards th e righ t. W h il e you do th is , you can al s o s e e th e form ation oftw o ne at l igh tning bol ts (Se e im g7).Adjus t th e am ount of s h arpne s s you w ant th e n, pre s s ‘O K ’. Ste p1.Launch th e GIM P and cre ate a ne w 256x768 im age . Go to Fil te rs >>Re nde r> >Sol id Nois e .In th e pop- up, e nte r th e val ue s as s h ow n in Im g1 or, ch oos e one of your ow n by h itting 'Ne w Se e d' button. Final l y, pre s s th e O K button to re nde r th e nois e .
Go to th e ‘Laye rs ’ dial og box and ch ange th e l aye r- m ode ofth e gradie nt l aye r to ‘D iffe re nce ’ s e e im g 4. Im m e diate l y, you can s e e th e form ation ofth e bol t.Now go to Im age >>Fl atte n Im age to fl atte n al lth e l aye rs into one s ingl e l aye r.Now go to Laye r>>Col or>>Inve rt to inve rt th e col or ofth e l aye r.
2D W ork sh op - Cre ating A Ligh tning Boltin th e Ste p5. To s e parate th e l igh tning bol ts as an Al ph a ch anne l , you w il lne e d to conve rt th e bl ack col or to al ph a.To do th at, go to Laye rs >> Trans pare ncy>> Col or to Al ph a. In th e Col or to Al ph a dial og, cl ick th e ‘From ’ button and ch oos e a bl ack col or th e n pre s s ‘O K ’.You now h ave an al ph a- bas e d ve rs ion ofth e l igh tning bol t (Se e im g8).Th e l as t th ing to do is s ave it in a fil e form at th at s upports trans pare ncy, l ik e PNG or TGA. random nois e ge ne ration w h ich can re s ul t in m ore varie d l igh tning bol ts .I h ope th is h as provide d you w ith a nice and e as y w ay to cre ate l igh tning bol ts . A Com pos itor Node O ve rvie w -b y D anie lLaBarge Sandra Gil be rt and Idis cus s e d th e fact th at w ith al l ofth e ne w fe ature s com ing from th e Bl e nde r re l e as e s , it is ofte n h ard to k e e p up w ith th e m . O fte n, you ne ve r actual l y ge t to us e th e fe ature in a proje ct be caus e you are s im pl y too bus y e xpl oring al lofth e diffe re nt w ays ofus ing th e ne w functional ity.To h e l p th os e ge t up to s pe e d fas te r, I'l lgive a q uick ove rvie w ofth e Com pos itor Node s ys te m . NOTE: Th e de s cription ofh ow e ach node w ork s is bas e d onl y on th e util ity and not on th e actual m ath e m aticalor graph icalfunctional ity ofth e node .A m ore accurate de s cription ofh ow e ach node functions and ope rate s is be yond th e s cope ofth is articl e and w il lprobabl y appe ar in future articl e s on th e Bl e nde r W ik i at h ttp://m e diaw ik i.bl e nde r.org. and jus t re ce ntl y by th e proje ct Pl um ife ros . Al th ough de s igne d for anim ations and com pute rge ne rate d im age ry, th e Com pos itor h as found its w ay into th e tool box ofm any graph ic artis ts w h o us e 3D and 2D program s to cre ate il l us trations and artw ork .Th e pos s ibil itie s are onl yl im ite d by your im agination and abs traction ofth e node - bas e d l ayout! Inputs Val ue s Inputs are variabl e s e ttings on al lEffe ct and O utput node s .Input node s do not contain inputs th e m s e l ve s , th e y us e th e inputs from th e actual Sce ne .An input can e ith e r be an RGBA val ue (Im age inputs )or a range val ue (Factor, Size , Val ue inputs ).Th e k e y diffe re nce be tw e e n RGBA val ue s and range val ue s are th at e ach pixe lre pre s e nts a col or/al ph a val ue or a val ue re pre s e nting an input am ount (0- 255). RGBA val ue s are typical l y th e pixe l s th at m ak e up th e finalim age w h e re as range val ue s are typical l y val ue s th at controlth e trans form ing ofth e pixe l s and are us ual l y Z , Ve ctor, Norm al , Al ph a or oth e r range val ue s . Inputs can onl y acce pt one input ch anne land re pre s e nt th e e ntire picture on a pe r pixe lbas is . Inputs are e ith e r from th e s ce ne or tak e n from th e output ofanoth e r node or a s e t val ue (s uch as Im age inputs , w h ich can s im pl y us e an RGBA val ue ). An RGBA val ue input is al w ays ye l l ow and a range val ue input is al w ays gray.Bl ue inputs are s pe cial inputs w h ich onl y w ork w ith th e as s ociate d s ce ne data (Norm aland Ve ctor ch anne l s ).An RGBA val ue input m ay h ave to be conve rte d to be us e d as a range val ue input.An input th at re pre s e nts e ach pixe lin an im age is ofte n re fe rre d to as an pixe lor im age m ap. l ik e Input Val ue s , O utput Val ue s are e ith e r RGBA or range val ue s .An RGBA val ue output is al w ays ye l l ow and a range val ue output is al w ays gre y and s pe cialch anne lval ue s (Norm aland Ve ctor ch anne l s )are al w ays bl ue .To vie w range val ue s , you m ay h ave to conve rt it to an RGBA val ue or us e s pe cialfil te rs w h e n vie w ing.An output th at re pre s e nts e ach pixe lin an im age is ofte n re fe rre d to as a pixe l m ap or im age m ap. W ith th at q uick prim e r on inputs and outputs and w h at can and cannot be us e d, l e t us tak e a l ook at h ow th e s e inputs and outputs can be us e d toge th e r w ith node s .Pl e as e note th at in th e fol l ow ing e xpl anations , an actualw ork ing m ode l w on't be de s cribe d but rath e r h ow e ach s e tting can be us e d w ith in e ach node and h ow , w h e n com bine d w ith oth e r inputs , th e y w il lch ange . Input Node s Re nde r Laye r Node s are inputs from th e Sce ne . Curre ntl y th e onl y avail abl e output s e ttings for th is node incl ude Im age (RGB), Al ph a, Z (de pth ), Norm al(m apping), and Spe e d (ve ctor).Th e Re nde r Laye r Node contains an Im age Pre vie w and a se l e ctor for s e l e cting Sce ne s and Re nde r Laye rs from th e s e l e cte d Sce ne .Note th at th e Norm al and Spe e d val ue outputs are col ore d bl ue , th is is be caus e th e y are s pe cialval ue outputs .Th e y can be tre ate d th e s am e as any range val ue , but onl y w ork for re l ate d node s . Th e Im age output dis pl ays th e RGB col or val ue s for e ach pixe l .Th e Al ph a output is a bl ack and w h ite range val ue w h ich re pre s e nts th e opacity for e ach pixe lw ith a range from 0 (bl ack /trans pare nt)to 255 (w h ite /s ol id).Th e Z output is a range val ue th at give s de pth inform ation (th e dis tance from th e cam e ra to th e virtualobje ct)on a pe r- pixe lbas is . us e fulfor control l ing th e ch ange s th at occur during an anim ation, and is ofte n us e d as an input for anoth e r node . Te xture Node is s im il ar to th e Im age Node e xce pt th at it us e s inte rnalte xture s from th e Bl e nde r s ce ne as th e inputs .Th is give s you a l ot ofcontrol be caus e you can us e Norm alm apping to control th e O ffs e t and Scal ing dynam ical l y and can us e th e RGBA val ue s as e ith e r a range Val ue output or an RGBA Col or output.Th is node al s o incl ude s an Im age pre vie w w h ich dis pl ays th e te xture s e l e cte d from th e s ce ne .Th is is good for adding proce dural te xture ove rl ays and gradie nt e ffe cts . O fal lofth e Input Node s , onl y th e Te xture Input actual l y h as input s e ttings .Th e s e are l im ite d to th e Bl e nde r s ce ne h ow e ve r, th e y are s til ldynam ic. O ve r al l , th e Input Node s are e s s e ntialto us ing th e Com pos itor as th e y s e rve as th e bas e to w h ich ch ange s are m ade .Th e y al s o al l ow for control ove r e ffe cts appl ie d to oth e r inputs .Th e th re e m os t com m onl y us e d Input Node s are th e Re nde r Laye r, Im age , and Tim e node s . NOTE: At th e tim e ofth is w riting, CVS ve rs ions ofBl e nde r incl ude ne w output node s .Th e s e node s w il lnot be dis cus s e d in th is articl e as th e y h ave not ye t m ade it into th e official Bl e nde r re l e as e . You s h oul d note , h ow e ve r, th at advance d node s do e xis t and w il lprobabl y be m ak ing th e ir w ay into future Bl e nde r ve rs ions . produce an e rror. Vie w e r Node is ide nticalto th e Com pos itor node e xce pt th at ins te ad ofdis pl aying re s ul ts to th e Re nde r Buffe r, it util ize s th e UVIm age Editor unde r th e Vie w e r Im age .Th is is a dynam ic im age th at dis pl ays th e pre vie w ofth e curre ntl y se l e cte d Vie w e r node .Th is m e ans th at you can h ave m ul tipl e Vie w e r node s w h ich w il ldis pl ay th e various outputs ofoth e r node s ...us e fulfor de bugging and te s ting diffe re nt attribute s ofth e com pos ition. Col or Node s RGB Curve s Node is a ve ry pow e rfulnode be caus e it can controlth e col or ofth e im age by varying th e infl ue nce ofe ach col or s e parate l y, and al lofth e col ors toge th e r.Th is node h as a Factor Input (range val ue )and an Im age Input (RGBA val ue ).Th e Im age O utput is a com bination ofal lof th e RGB Curve s w h ich incl ude Com bine d, Re d, Gre e n, and Bl ue .Th e re are “+ ” and “- ” s ym bol s w h ich zoom in and out accordingl y s o th at you can fine tune th e curve and al ign it m ore e as il y to th e grid. Th e w re nch icon al l ow s for controlove r th e grid vie w and th e curve h andl ing (Auto and Ve ctor), and it al s o al l ow s you to re s e t th e curve to th e l ine ar de faul t.An orange grid icon al l ow s for cl ipping to controlth e m axim um val ue s .Th e “X” icon de l e te s th e curre ntl y se l e cte d point.Points are s e l e cte d us ing th e Le ft M ous e Button (LM B). Ne w points are adding by us ing Ctrl + LM B.Th is node is m os t com m onl y us e d for contras t control and for fine tuning th e col or range s .It is e as y to m ak e ve ry boring im age s inte re s ting us ing th is node . titl e w ork as w e l las com pos iting s ce ne s . Z Com bine Node is a ve ry inte re s ting node in th at it can e as il y ge t tangl e d.It h as a s ingl e Im age output but acce pts tw o Im age inputs and tw o Z range val ue inputs .It com bine s th e pixe l s bas e d on th e Z range val ue s and pas s e s th at com bine d im age to th e output.Th e probl e m w ith th is is th at th e Z val ue th at corre s ponds to th e Im age (at l e as t in th e s ce nario w h e re th is node is us e ful )is th e be l ow th e oppos ite Im age input. Th us , th e noodl e s th at conne ct th e node s can e as il y ge t cros s e d and fol l ow ing th e m ge ts m e s s y ifm ul tipl e node s are us e d.Th is node is m os t com m onl y us e d w ith s ce ne com pos iting.In th is m e th od, th e s ce ne is re nde re d in s e ctions and l aye rs .Th e l aye rs are re as s e m bl e d afte r pos tproduction is com pl e te d.Us ual l y th e s ce ne 's Z ch anne lis us e d to do th is . Ve ctor Node s Norm alNode h as to be one ofth e cool e s t node s avail abl e .Ionl y re ce ntl y figure d out h ow am azing it re al l y is .Bas ical l y, you can th ink ofit as a pos tproduction l igh t.It us e s th e Norm alch anne las its input and th e n you can m ove a l ittl e s ph e re around to re l ocate th e l igh t s ource .Th e avail abl e outputs incl ude th e re m appe d Norm alch anne land a D ot range val ue output w h ich re pre s e nts th e l igh t and norm alinte ns ity in a grays cal e pixe lm ap.Th e pos s ibil itie s for th is incl ude s pe cul ar m apping, nigh t l igh ting, s ubs urface s catte ring, and m uch m ore . Ve ctor Curve s Node is s im il ar to th e RGB Curve s node in th at you can controlth e Ve ctor ch anne l val ue s for th e X, Y, and Z axis .Th e onl y input and output are Ve ctor ch anne ldata w h ich m us t be l oade d e ith e r from a Norm alnode or th e s ce ne its e l f.It contains th e s tandard curve w idge t and controlfe ature s .Th is node is m os t us e fulfor re m apping th e Ve ctor ch anne lfor fine tuning m otion bl ur, e tc. M ap Val ue Node is anoth e r us e fultoolfor ch anging val ue range s .It acce pts any range Val ue input and can l im it its M inim um and M axim um val ue s and can be furth e r m odifie d bas e d on Size and O ffs e t val ue s .Th e s e s l ide rs are not l im ite d to 0.0 and 1.0 be caus e th is node is not de s igne d onl y for range val ue s ofth at k ind.It al s o acce pts Z , Norm al , and Ve ctor ch anne l s and can is ofte n us e d in com bination w ith th e Z ch anne lto re m ap it for fore ground and back ground bl ur or in com bination w ith a Ve ctor ch anne lto produce m otion bl ur. Fil te r Node s Fil te r Node is th e m os t com m onl y us e d node in th is s e t.It can be us e d for a broad range of e ffe cts , s uch as s oft bl urring, e dge e nh ance m e nts for cartoons , ne on s igns , de cal s , and m uch m ore . Th is node acce pts an Im age input w h ich can be control l e d us ing a Factor range val ue and w il lth e n m odify th e pixe l s bas e d on a diffe re nt fil te r or e ffe ct type .Th e re s ul t is pas s e d to th e Im age output.Th e s ofte n fil te r type appl ie s a ve ry s m al l bl ur to th e pixe lto e l im inate s m al lartifacts . Sh arpe n atte m pts to e nh ance th e e dge s be tw e e n th e pixe l s to de fine th e e dge s be tte r (th is ofte n cre ate s artifacts ).Lapl ace , Sobe l , Pre w itt, and K irs ch are al lve ry s im il ar and th e y e nh ance th e e dge s and dark e n th e re s t.Sh adow is k ind ofl ik e e ngraving and appl ie s a s e l fs h adow on th e e dge s .Th is node is ofte n us e d to m ak e im age s th at are “too pe rfe ct” s e e m cris pe r. Bl ur Node is a ve ry s im pl e node .It tak e s an Im age input and (bas e d on a Size range val ue w h ich infl ue nce s th e am ount ofbl ur)w il lbl ur th e pixe l s bas e d on diffe re nt fil te rs or m e th ods .It w il lfil te r it bas e d on an X and Y val ue and can e ve n be appl ie d to Gam m a corre cte d val ue s .Enabl ing Bok e h fil te ring w il lus e a circul ar fil te r ins te ad of th e s im pl e s q uare m e th od.Am ong th e fil te r m e th ods avail abl e are Fl at, Q uadratic, Cubic, Gaus s ian, CatRom , M itch , and Te nt. Each one fil te rs diffe re ntl y and any one ofth e m can be us e d to obtain th e de s ire d e ffe ct.Th e re s ul ting e ffe ct is appl ie d to th e im age and pas s e d to th e Im age output.Th is is ve ry us e fulfor D e pth ofFie l d and m otion bl ur.It can al s o be us e d cl e ve rl y for inte re s ting titl e w ork and ove rl ays . Ve ctor Bl ur Node is bas ical l y a one - purpos e node , but it doe s its job ve ry w e l l .It re q uire s th re e inputs to ge ne rate th e de s ire d output.Th e s e th re e inputs are an Im age , a Z ch anne lm ap, and a Ve ctor Spe e d input.Al lofth e s e can be gath e re d from th e s ce ne and Ve ctor Node s .Th is m e th od us e s al l th re e ch anne l s toge th e r to bl ur th e im age bas e d a pixe ls tre tch ing m ode l .Th e inne r w ork ings ofth is m e th od are be yond th e s cope ofth is articl e but th e functional ity is a ve ry fas t and e fficie nt pos tproduction e ffe ct.It us e s a Sam pl e val ue to controlth e q ual ity ofth e bl ur, a M inSpe e d to s e t th e m inim um s tre tch for e ve ry pixe land a M axSpe e d for th e m axim um s tre tch for any pixe l .It th e n us e s a Bl urFactor w h ich can be us e d to fine tune th e bl ur from s trong to w e ak .Th e h igh e r th e Sam pl e s and th e h igh e r th e Bl urFactor, th e s tronge r th e bl ur.It is im portant to s e t th e M in and M ax s pe e ds to incl us ive e nough val ue s , but not too broad to be com e m e m ory inte ns ive .Th is node is m os t ofte n us e d for m otion bl ur. th e RGBA Im age input and can be us e d as s uch or as a val ue output. Se parate RGBA Node is ve ry ve rs atil e be caus e it al l ow s you to m odify e ach col or ch anne l inde pe nde ntl y.It acce pts an RGBA Im age input and outputs th e corre s ponding Re d, Gre e n, Bl ue , and Al ph a ch anne l s as grays cal e val ue s .At th e tim e ofth is w riting, th e ne xt officialre l e as e of Bl e nde r w il lincl ude a Com bine RGBA Node w h ich w il ldo th e re ve rs e ofth is node . Se parate H SVA Node is e s s e ntial l y th e s am e as th e Se parate RGBA node but it s e parate s th e H ue , Saturation, Val ue , and Al ph a ch anne l s for th e im age .Th e y are grays cal e val ue s jus t l ik e th e Se parate RGBA node .At th e tim e ofth is w riting, th e ne xt officialre l e as e ofBl e nde r w il lincl ude a Com bine H SVA Node w h ich w il ldo th e re ve rs e of th is node . Se t Al ph a Node is good for titl e w ork and ove rl ays but h as it's purpos e in oth e r node s as wel l .It acce pts an RGBA Im age and th e n al l ow s an Al ph a val ue to be s e t or ove rw ritte n by a Val ue input.Al ph a val ue of0.0 is trans pare nt and 1.0 is opaq ue .Th e com bine d RGBA val ue s are pas s e d to th e Im age output.Th is node is ofte n us e d w ith a Tim e node to controlth e fade in or fade out ofa s ce ne . Trans l ate Node is th e onl y m oving anim ation node avail abl e at th e m om e nt (m ore advance d node s for rotation, e tc.are be ing de ve l ope d).Th is node w il ltrans l ate or m ove an Im age input a s e t val ue from th e top l e ft ofth e bas e canvas s ize .It w il lbe m ove d X (h orizontal )pixe l s by Y (ve rtical )pixe l s. Th e s e val ue s can be variabl e X and Y inputs w h ich is us e fulfor anim ations w h e re a Tim e node can be us e d to s l ide a s ce ne or im age acros s th e canvas . Th e re s ul ting Im age is output w h ich can th e n be pl ace d on top ofanoth e r Im age for “m e rging dow n”. Group Node s Group node s are noth ing m ore th an cus tom node s w h ich are m ade by tak ing th e ge ne ric node s and grouping th e m w ith Ctrl + Gk e y.Th is group is th e n avail abl e as a dupl icate to th e curre nt group.To ungroup th e node s , you can pre s s Al t+ Gk e y.To add a group node you can e ith e r us e th e Add m e nu or pre s s Sh ift+ Gk e y for a l is t ofcurre ntl y avail abl e node s .W ork ing w ith group node s can s ave a l ot oftim e for re pe titive e ffe cts , but s h oul d be us e d w ith caution.A ne w group s h oul d be adde d, th e n ungroupe d and re groupe d as a diffe re nt group node .Th is ge ts around th e probl e m ofcopy node s ins te ad ofdupl icate node s . Group node s are m os t ofte n us e d in th e de faul t Bl e nde r fil e , th at w ay com m onl y us e d e ffe cts can be done q uick l y. Concl us ion Iw oul dl ik e to e ncourage you to e xpl ore th e various s e ttings and us e s for th e node s .Al s o, vis it th e s upport forum s for various re fe re nce s ch e m atics w h ich can h e l p you unde rs tand th e m ath e m aticaland graph icalfunctional ity ofe ach node .For practicalpurpos e s , th e Com pos itor is a ve ry pow e rfultooland s h oul dn't be cons ide re d a gl orifie d Se q ue nce r – you can do a l ot m ore w ith th is th an you coul d e ve r do w ith th e Se q ue nce r.In fact, Iw oul dn't be a bit s urpris e d ifyou ne ve r us e th e Se q ue nce r again! Th is h as be e n a brie fde s cription ofth e Com pos itor, w h ich is onl y h al fofth e Node w indow . Th e re is m ore to l e arn, s uch as th e inte rface , th e M ate rialnode s , and th e various w ays in w h ich th e s e node s can be us e d toge th e r. Again, Ie ncourage e ach us e r to practice us ing node s and l e arn th e “ins and outs ” ofth is tool . H ave fun! Re fraction occurs w h e n th e e ne rgy of an incom ing l igh t w ave m atch e s th e naturalvibration fre q ue ncy ofth e el e ctrons in a m ate rial .Th e l igh t w ave pe ne trate s de e pl y into th e m ate rial , and caus e s s m al lvibrations in th e e l e ctrons .Th e e l e ctrons pas s th e s e vibrations on to th e atom s in th e m ate rial , and th e y s e nd out l igh t w ave s ofth e s am e fre q ue ncy as th e incom ing w ave .But, th is al ltak e s tim e .
Th e part ofth e w ave ins ide th e m ate rials l ow s dow n, w h il e th e part ofth e w ave outs ide th e obje ct m aintains its originalfre q ue ncy.Th is h as th e e ffe ct of be nding th e portion ofth e w ave ins ide th e obje ct tow ard w h at is cal l e d th e norm all ine , an im aginary s traigh t l ine th at runs pe rpe ndicul ar to th e s urface of th e obje ct.Th e de viation from th e norm all ine ofth e l igh t ins ide th e obje ct w il l be l e s s th an th e de viation ofth e l igh t be fore it e nte re d th e obje ct. Th e am ount ofbe nding, or angl e ofre fraction, ofth e l igh t w ave de pe nds on h ow m uch th e m ate rial sl ow s dow n th e l igh t. D iam onds w oul d not be s o gl itte ry ifth e y did not sl ow dow n incom ing l igh t m uch m ore th an, s ay, w ate r doe s . D iam onds h ave a h igh e r inde x ofre fraction th an w ate r, w h ich is to s ay th at th e y s l ow dow n l igh t to a gre ate r de gre e .
th e gl as s .As s uch , it is s l ow e d dow n to a gre ate r e xte nt th an a w ave ofre d l igh t, and w il lbe be nt to a gre ate r de gre e .Th is accounts for th e orde r ofth e col ors th at w e s e e in a rainbow .It is al s o w h at give s a diam ond th e rainbow fringe s th at m ak e it s o pl e as ing to th e e ye . D e finition ofInde x ofRe fraction tak e n from h ttp://s cie nce .h ow s tuffw ork s .com /l igh t12.h tm For a m ore te ch nicalde s cription you ch e ck out th e e xpl anation at h ttp://e n.w ik ipe dia.org/w ik i/Re fractive _ inde x Now w h y is th is im portant?W h e n cre ating m ate rial s , you ne e d to tak e Inde x ofRe fraction into account.O th e rw is e , your m ate rial s w il lnot be convincing. And w ith th e ne w trans m is s ivity fe ature adde d in th e l as t re l e as e in addition to th e IO R s e ttings pane lal re ady in pl ace , bl e nde r is capabl e ofconvincing IO R val ue s . H e re is a l is t ofIO R val ue s for your re fe re nce .Th is im age is rath e r s m al l , for a cl e are r copy pl e as e ch e ck th e pdfincl ude d w ith th is is s ue . Th e l as t ye ar h as s e e n a m ajor incre as e in us e r docum e ntation.W ith th e arrivalofne w book s in s e ve rall anguage s , dow nl oadabl e m anual s and cl as s book s /cours e s , l e arning Bl e nde r h as be com e e as ie r th an e ve r.Le t’s tak e a l ook at w h at is curre ntl y avail abl e for our e ducationale njoym e nt. Inte re s te d in w riting articl e s for Bl e nd e rArtM agazine ? 1. W e acce pt th e fol l ow ing: Tutorial s e xpl aining ne w Bl e nde r fe ature s , 3d conce pts , te ch niq ue s or articl e s bas e d on curre nt th e m e of Re ports on us e fulBl e nde r e ve nts , th rough out th e w orl d. Cartoons re l ate d to bl e nde r w orl d. Inte rvie w s ofw e l lk now n Bl e nde rh e ads . th e m agazine . 2. Se nd s ubm is s ions to s and ra@ b l e nd e rart.org. Se nd us a notification on w h at you w ant to w rite and w e can fol l ow up from th e re . Som e guide l ine s you m us t fol l ow . Im age s are pre fe re d in PNG but good q ual ity JPG can al s o do.Im age s s h oul d be s e pe rate from th e te xt docum e nt. M ak e s ure th at s cre e ns h ots are cl e ar and re adabl e and th e re nde rs s h oul d be at l e as t 800px, but not m ore th an 1600px at m axim um . Se q ue ntialnam ing ofim age s l ik e im age 001.png...e tc. Te xt s h oul d be in e ith e r O DT, D O C, TXT or H TM L. Arch ive th e m us ing 7zip or RAR or l e s s pre fe rabl y zip. Note : Al lth e approve d s ubm is s ions can be pl ace d in th e finalis s ue or s ubs e q ue nt is s ue if de e m e d fit. Al ls ubm is s ions can be croppe d if ne ce s s ary. Th ink you h ave s om e proficie ncy in w riting articl e s? W ant to contribute articl e s and s h are your k now l e dge w ith bl e nde rh e ads around th e w orl d? Le arn h ow to contribute to Bl e nde rart M agazine h e re !! D is cl aim e r bl e nde rart.org doe s not tak e s any re s pons ibil ity both e xpre s s e d or im pl ie d for th e m ate rialand its nature or accuracy ofth e inform ation w h ich is publ is h e d in th is PD F m agazine .Al lth e m ate rial s pre s e nte d in th is PD F m agazine h ave be e n produce d w ith th e e xpre s s e d pe rm is s ion ofth e ir re s pe ctive auth ors /ow ne rs .bl e nde rart.org and th e contributors dis cl aim al lw arrantie s , e xpre s s e d or im pl ie d, incl uding, but not l im ite d to im pl ie d w arrantie s ofm e rch antabil ity or fitne s s for a particul ar purpos e .Al lim age s and m ate rial s pre s e nt in th is docum e nt are printe d/re - printe d w ith e xpre s s e d pe rm is s ion from th e auth ors /ow ne rs . Th is PD F m agazine is arch ive d and avail abl e from th e bl e nde rart.org w e bs ite .Th e bl e nde rart m agazine is m ade avail abl e unde r Cre ative Com m ons â&#x20AC;&#x2DC; Attribution- NoD e rivs 2.5â&#x20AC;&#x2122; l ice ns e .